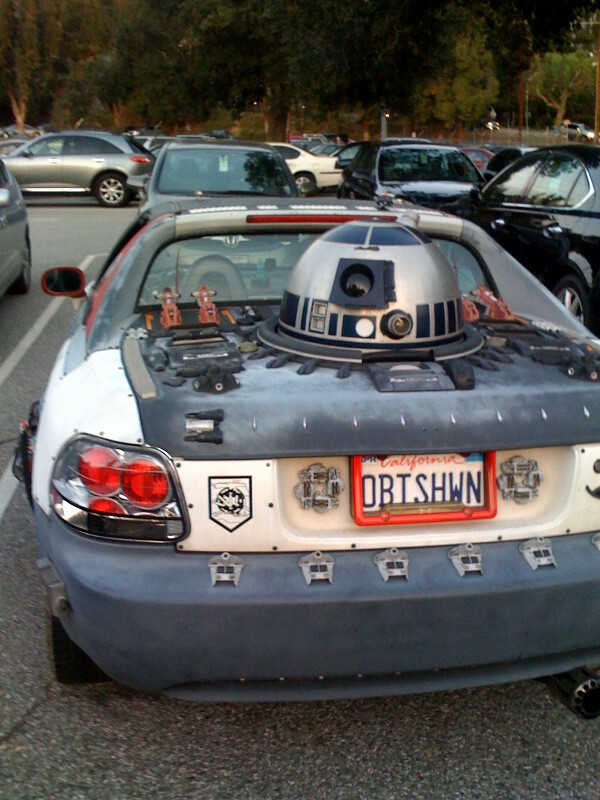 Had to take a photo of this car in the Jet Propulsion Laboratory parking lot. Technology was first baked into my brain after I graduated from Pasadena High School. I managed to graduate from high school in 1986 after only having used a word-processing enabled computer a handful of times. I borrowed a couple of computers from friends to write papers and used another friend’s to play games. This topic popped into my head because I’ll be attending the Tecnificate conference in Santa Barbara today and for many in the Santa Barbara area this may be their first inroad into technology. In my final weeks of high school I applied for a couple of internships, one at the City of Hope in Duarte and another at Jet Propulsion Laboratory. I was accepted to both programs but chose the JPL one because it paid much more money even though the City of Hope opportunity was closer to my intended area of study in at Stanford which was medicine. JPL was an amazing place with amazingly intelligent people. I worked in the Materials Testing Lab so I got to pull, break, tear, and cut stuff and measure how much force it took to do so. As part of the summer minority research program, I had other young colleagues on campus and got to learn about the different divisions. My own natural curiosity led me to meet some pretty incredible technologists. At one point things were a bit slow in the lab so I started messing around in the machine lab, trying to build an artificial hand out of Plexiglas and metal tubes. My supervisor asked what I was doing and when I told him I was trying to construct an artificial hand, he suggested I talk to a Dr. Gordon Bagby, and expert in robot technology and artificial intelligence. Dr. Bagby was a unique fellow and in our conversation he said that it was the natural course of evolution that machines would run the earth. This blew my mind. As I devote Catholic I had a particular world view of how things started and would end. Dr. Bagby shared a book on LISP, the primary language used in artificial intelligence programming. It wasn’t so much a book about LISP procedures and syntax as it was a book on the building blocks of understanding the way LISP worked. I didn’t know how to program in any language so it was extremely difficult to pick up. Although LISP didn’t take, I saw the power of using computer programming to solve immense problems like sending complex machines into space. I applied that learning in the lab and suggested to my supervisor that we could connect one of our giant tensile testing machines directly to the IBM PC in the office and save time by not manually doing computations. Luckily we had a whiz of a programmer in a nearby lab and he was glad to write the connecting program. After he wrote the program in BASIC, I studied the code like just that, code. I still didn’t have the patience to learn the language but that was my first foray into systems analysis. We saved hours of work per week with that simple computer innovation. I’d later learn to program in various languages, helping my former employer earn seven figures over the years with the e-commerce system I helped write. I also went on to get my Masters in Computer Information Systems and taught an Information Systems course at California State University at Channel Islands. I sometimes go back and think about what would have happened if I had chosen the City of Hope internship but am glad with the way things worked out. I still think about the words of Dr. Gordon Bagby and see him when I hear about other tech futurists like Ray Kurzweil who are continuously blowing my mind. This entry was posted in Personal, Technology and tagged artificial intelligence, computers, Jet Propulsion Laboratory, programming, Technology. Bookmark the permalink. Have you seen the Ray Kurzweil documentary, Transcendent Man? It’s on Netflix, I think. At least that’s where I saw it. It was fascinating.